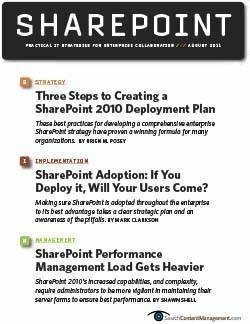 Many IT organizations are turning to Microsoft SharePoint 2010 as their collaboration technology platform. 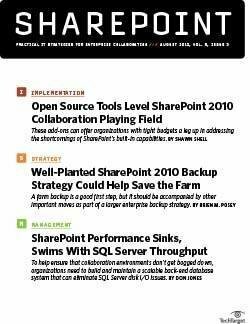 But in order for SharePoint deployments to lead to effective use of the collaboration software, companies need to plan carefully and manage their implementations properly. This e-book offers expert insight into deploying SharePoint, best practices from experts, and what you need to know to get your organization up to speed for an effective SharePoint deployment. You'll also learn about important pitfalls to avoid. 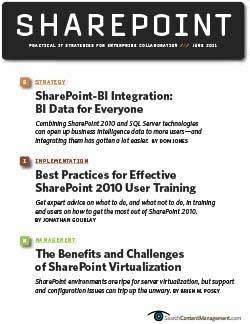 Get answers to your toughest SharePoint 2010 questions in this e-book.